The best part of designing bikes is coming up with solutions. Often this comes about from an offhand comment from a rider. When I hear it, I realize I can bring more to the bicycle design than either of us planned on originally. Here’s an example. I recently built a Georgena Terry Gale Force bicycle for a rider who mentioned that the roads in her area were really rough. Steel bikes are great at absorbing road shock, but a wider tire can help as well. 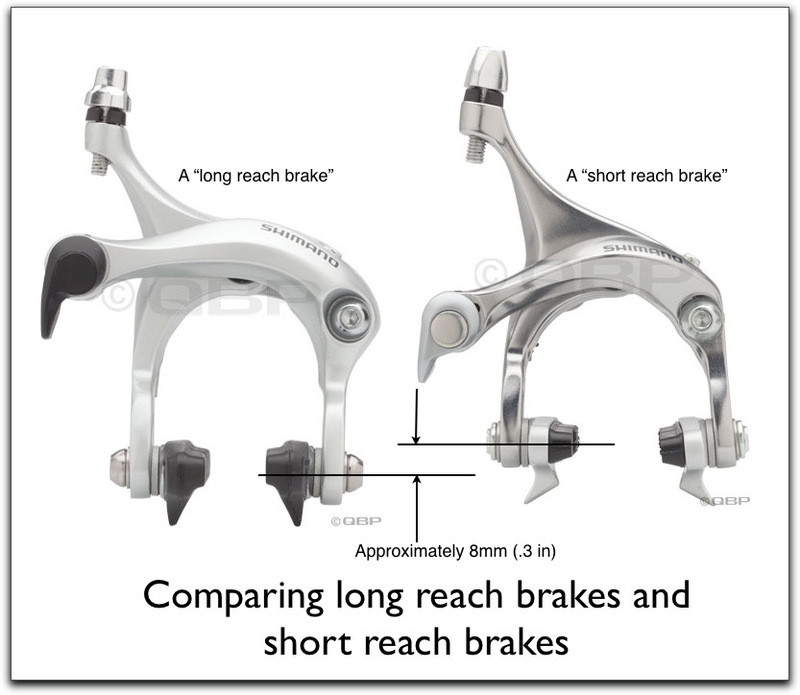 The problem is that a traditional road bike uses a “short reach brake”, which may limit the width of the tire that can be used. It’s often not possible to use tires wider than 25mm (1 inch) with this kind of brake. As the tire gets wider, it gets taller. And there’s the rub — literally. The wider tire is too close to the underside of the brakes. Imagine picking up a small stone and having it jam between the tire and brake. Not good. “Long reach brakes” solve this problem. The arms of the brake are about 8mm (.3 inch) longer than the arms on short reach brakes. If a bike is specced with this brake, the rider can use wider tires. So when my customer mentioned rough roads, I offered her the option of long reach brakes so she could put wider tires on her bike. A simple solution that added versatility to the bike. Unfortunately, you can’t just swap out your short reach brakes for long reach brakes to solve this problem. The bike has to be built for one style or the other.